Sami McGinnis remembers walking into a polling place and casting her vote for the first time. “It was a wonderful feeling to have that freedom,” she said. McGinnis, 67, whose vision is impaired, gave up that freedom eight years ago after her husband died. That’s when she first voted by absentee ballot. Having no family near her Mesa, Ariz., residence, she found it difficult arranging transportation — especially on Election Day. She wishes it were possible for her to physically vote inside a polling place because she questions whether her absentee ballot is counted. One in nine voting-age Americans is disabled, according to Census data. Of the 17 percent of voting-age Americans who are 65 years or older, at least 36 percent are disabled. At a time when 37 states have considered photo ID legislation, some disabled and elderly Americans may face difficulty voting this November because they often don’t have a valid driver’s license. The result is that voter turnout among these groups likely will decrease, according to Rutgers University research. “Voting is a big deal. It’s a big highlight of their years,” said Daniel Kohrman, a senior attorney for AARP in Washington, D.C.
“It’s really unfortunate, and indeed tragic, that this emphasis on restricting participation is presented in so many states,” Kohrman added. Eighteen percent of Americans over 65 do not have a photo ID, according to the Brennan Center for Justice at New York University, a public policy group that opposed many of the voting rule changes nationally. The Census estimates at least 7 million seniors don’t have driver’s licenses. Many people with disabilities also don’t have a driver’s license. Beyond physical disabilities, persons can have learning disabilities — dyslexia for example — or poor hand-eye coordination. “They’ve stopped driving because of vision or reflex issues. They, for reasons of various disability issues, have moved in with family who drive them around, or they’ve moved into an assisted living center,” said Jim Dickson, leader of the Disability Vote Project. The nonpartisan project of the Washington, D.C.-based American Association of People with Disabilities, encourages political participation by those with disabilities. Voter ID requirements aren’t the only problem disabled and elderly people may face at the polls. People in these groups often have trouble accessing traditional polling places. All polls are supposed to comply with the Americans with Disabilities Act of 1990. Among other things, the sweeping law says that people with disabilities shall not face discrimination at the polls. But, just under one-third of polling places are 100 percent barrier free, according to a 2009 Government Accountability Office study of the 2008 election. Many states skirt the accessibility to polls by allowing absentee voting, mail voting or voting from curbsides, where a poll worker comes to a disabled person’s car with a ballot. All states allow absentee and mail voting, but not all — Tennessee, for example — allow curbside voting. “People with disabilities should have the same options as everyone else has. Voting in a polling places is an important and symbolic ritual,” said Lisa Schur, a Rutgers University associate professor who researches disabilities issues in employment and the ADA impact on public policy. 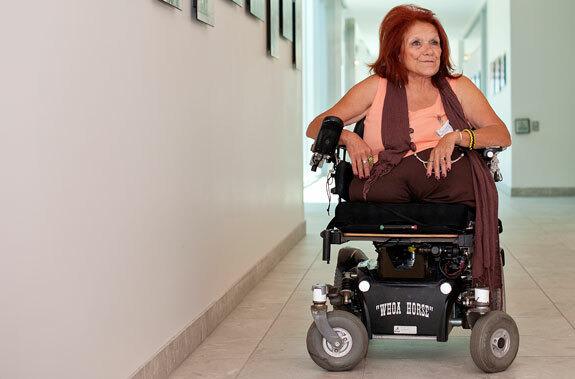 Leaving the disabled with only alternative voting methods “sends a clear message that people with disabilities are not fully welcome in the political sphere,” she said. The convenience of absentee voting is appealing to Karin Kellas of Glendale, Ariz. (pictured) She suffered a spinal cord injury as a result of a rollover car accident in 1966. In the ’90s, her legs were amputated above the knee. Kellas votes absentee so she can skip the lines and volunteer to work the polls. If she wanted to vote in a traditional polling place, she’d find a way to get there as she did in the past. Inaccessible polling places can have “psychological consequences that say, ‘I don’t really want you here,’” Schur said. Voter turnout among disabled people is a clear reflection of that, according to a Rutgers University study from the 2008 election. The study showed turnout among voters who have disabilities was about 7 percentage points lower than those without disabilities. And that’s not because disabled people are less interested in voting, said Douglas Kruse, a Rutgers University professor and director of the doctoral program in industrial relations and human resources. He and Schur co-authored the study. Kruse, who uses a wheelchair, has a doctorate in economics from Harvard University. His research has found that disabled persons are less likely to be recruited to vote or participate in political activities. It’s important for persons with disabilities to vote because political and social issues deeply affect them, McGinnis said. “We take the time to get to know the issues because we live them,” she said.